It also raises some legal red flags, especially if any part of Musk’s tweet is found to be untrue, according to a legal expert interviewed by Business Insider. Elon Musk‘s quest to become the most unorthodox CEO of all time took another strange turn on Tuesday. Tesla’s stock immediately hit intraday highs, spiking more than 8% for the session before trading was halted about 2 p.m. ET. The shares resumed trading around 3:45 p.m. ET and quickly set another new daily high, climbing as much as 13%. The stock closed at $US379.57, up from $US344 where it started the day. In the end, Tesla added roughly $US7 billion in market value on the day. The stock also received a boost shortly before Musk’s tweet on reports Saudi Arabia’s sovereign wealth fund acquired a $US2 billion stake in the company. With Musk’s tweet, Tesla was plunged into unprecedented market territory. Never before has the CEO of a company so massive and widely followed disclosed something so sensitive on a social-media platform like Twitter. Harvey Pitt, who formerly served as chairman of the Securities and Exchange Commission (SEC), made similar comments during an interview on CNBC. In his mind, whether Musk did something illegal comes down to the CEO’s motive in the manner. Sichenzia says there could very well be an SEC investigation into the veracity of Musk’s market-moving tweet. 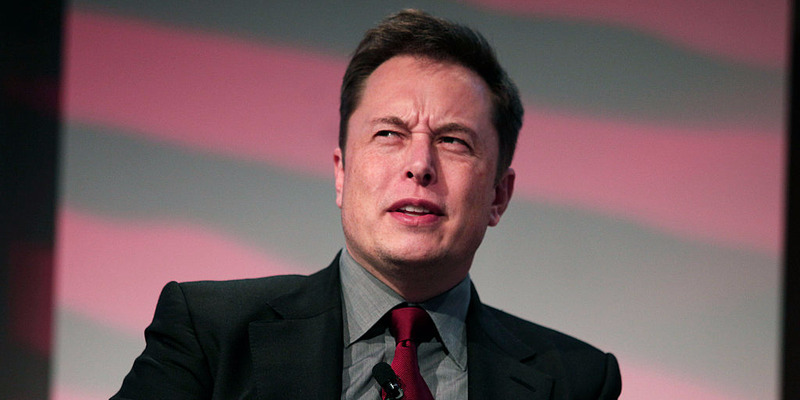 He says Musk should be particularly worried about a violation of Rule 10b-5 under the Securities Exchange Act of 1934, which deals with the release of misleading statements. Perhaps the most damning part of Musk’s tweet, as it pertains to Rule 10b-5, is once again its specificity, Sichenzia said. Even if it comes out that Musk had a fully funded deal in place at $US400 per share, rather than $US420, that could still be construed as materially misleading information. Musk could also be facing a bevy of private legal challenges, Sichenzia said. He said it is an entirely realistic scenario if Tesla’s stock drops suddenly in the upcoming days. “As a public company, we are subject to wild swings in our stock price that can be a major distraction for everyone working at Tesla, all of whom are shareholders,” he added. 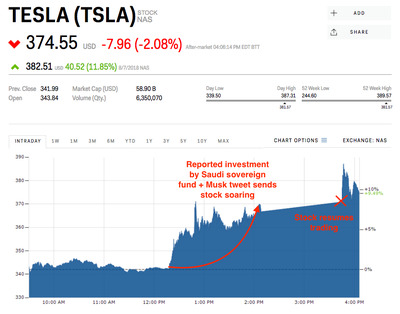 Immediately after Musk’s initial tweet about taking Tesla private, cynics on Twitter wondered aloud: Is this just the CEO’s latest strike in his months-long battle against short sellers? If so, the ensuing stock surge was a victory of sorts for Musk. The 8% increase likely cost short sellers hundreds of millions, squeezing their positions like a vice. After all, Tesla is the most shorted company in the US market by a margin of billions – and such large, extended positions have huge downside. In the event that Tesla does get taken private at the $US420-per-share price floated by Musk, Tesla bears will incur a $US4.4 billion loss on the positions they have built throughout 2018, according to financial technology and analytics firm S3 Partners. To fully understand what a victory this is for Musk, one must be familiar with his ongoing crusade – which he usually wages on Twitter. “If you’re short, I suggest tiptoeing quietly to the exit … ” he taunted in May, following Tesla’s previous earnings report. In the end, whether Musk’s tweet was a ploy to crush short sellers, an attempt to manipulate Tesla’s stock, or a completely legitimate – albeit unconventional – corporate announcement, one thing is certain: The CEO never fails to entertain.